The Pyrenees Ranges offer visitors a wonderful mix of natural and cultural history, with spectacular views, rugged mountain ranges, abundant wildlife, a rich mix of wildflowers and historic sites. The main attractions of the forest are the Waterfalls Picnic Area, Governor Rock Lookout and the Pyrenees Endurance Walk. Other nearby attractions include the Percydale Historic Area, the Landsborough Flora and Fauna Reserve and the numerous wineries located around the Ranges. The Pyrenees Ranges State Forest is approximately 200 kms north-west of Melbourne near the town of Avoca. Avoca can be accessed via the Sunrayasia or Pyrenees Highways. 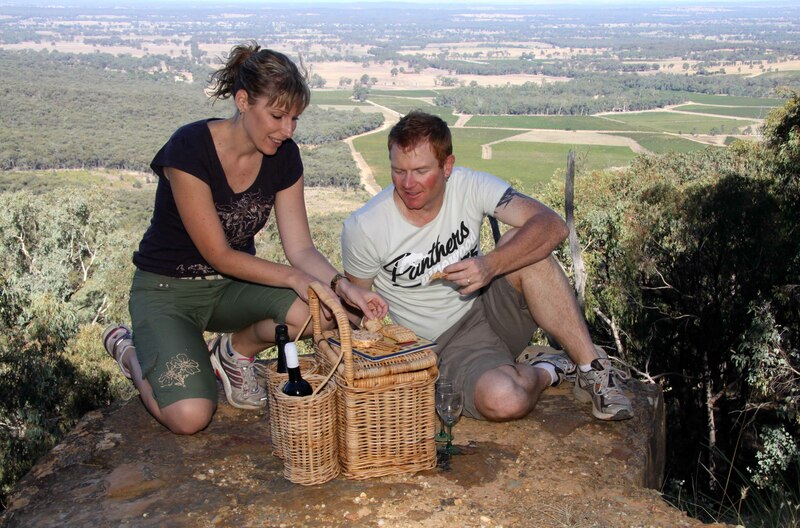 Once in Avoca travel west along Vinoca Road following the signs to the wineries then on to the Waterfalls Picnic Area. The Jajowurrong people were the first to occupy the Pyrenees and knew the area as `Peerick’. In 1836 Major Thomas Mitchell travelled through the region. After him came pastoralists and then in the 1854 gold was discovered. The foothills of the Ranges contain many relics from the gold mining era with mining holes and other relics still visible today. Slate quarrying also occurred in the forest, with the material obtained used to pave the footpaths of central Melbourne. Timber harvesting began in the 1840’s to supply the growing communities surrounding the forest and continues today on a sustainable basis. Rising nearly 800 metres the Pyrenees Ranges contains many natural attractions for the visitor. Box-Ironbark forests are dominant on the foothills with mixed species stringybark forests being found at higher elevations. Due to the diversity of the terrain, there are more than 200 species of plants and over 100 bird species recorded in the forest. Look out for Wedge-tailed Eagles high in the sky and, closer to earth, Parrots, Galahs and smaller migrant birds like Rainbow Bee-eaters. Also look out for kangaroos, wallabies, koalas and possums. In the drier months, you may see echidnas on the tracks, and there are a variety of reptiles, including legless lizards, Bearded Dragons and Goannas. The predominant trees are Ironbark, Yellow Box, Red Stringybark, Bluegum and Messmate. Orchids such as the Waxlip Orchid and Lilies abound, especially around the base of the range. A variety of Wattles and other wildflowers make spectacular viewing in the spring. The Pyrenees Endurance Walk is 18 km one way and is recommended as an overnight trip starting at the Waterfalls Picnic area with Camerons Track being the halfway point. This walk is considered to be reasonably difficult with some steep sections. In drier months, you will need to carry your own water. A pleasant after lunch walk, this track is signposted from the Waterfalls Picnic Area and follows the course of the No.2 Creek upstream to a rock outcropping. Water flows in the winter months only, or after heavy rainfall. There are numerous tracks throughout the forest, which also make ideal short walks. From the Waterfalls Picnic Area an easy walk along Ebling Track to Fraser Track and back will take approximately 1 hour or a walk along Waterfalls Track onto Schmidt Track to Sugarloaf Track and back will take 2 hours. For those seeking a picnic site in a relaxing forest setting, the Waterfalls Picnic Area is hard to beat, being easily accessible from Avoca, with toilets, picnic tables, fireplaces, rainwater and a short walk available for day visitor use. Toilets, picnic tables, fireplaces and rainwater are also available at Cameron’s Track Campground, with simpler facilities (picnic tables and fireplaces only) available at the Governor’s Rock Lookout. The Department of Sustainability and Environment (DSE) is responsible for managing Victoria’s State Forest. For further information contact the Department of Sustainability and Environment office at Ballarat (Ph: 5336 6856) or DSE’s Customer Service Centre on Ph: 136 186.